In fall of 1998, I attended a spaghetti feed at Marin Catholic High School the night before a high school cross-country meet. There was a speaker: one Ann Trason. I'm sure she delivered some heartening story of perseverance and finding one's passion, but I don't really remember what she said. I do remember something she talked about, though: running 100 miles. 100 miles?! What?! People run that far? That's like four marathons! Are you for real? This tiny little lady has run 100 miles? In one go? That's crazy! It turns out Ann Trason had run a lot of 100 mile races...and she'd run them faster than anyone else in history, including most men. 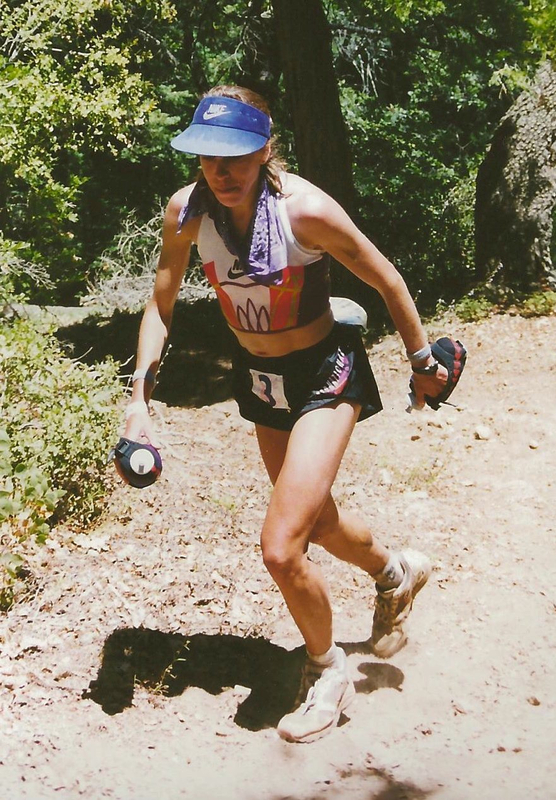 One of those races was the Western States Endurance Run, which she had just won for the tenth straight year in a row a couple months earlier (she would go on to win four more times by 2003). I might have forgotten all about Western States and Ann Trason, had I not also come across an article in the Oakland Tribune shortly thereafter. I remember there was a picture of her running along the waterfront in Crockett, and the story talked about how she and her husband would run from Oakland to Crockett, eat a meal at a seafood restaurant there, then run back: a distance of some 30 or 40 miles. Each way. People can run that far? People can eat an entire meal and then go running right after? That's nuts! Still, a seed was planted. Many, many years later, I moved to Yosemite, a place filled with badasses of all sorts - artists and musicians and doulas and rock climbers and gardeners and paragliders and cooks and skiiers and crossword puzzlers. I was inspired to push myself to the next level. 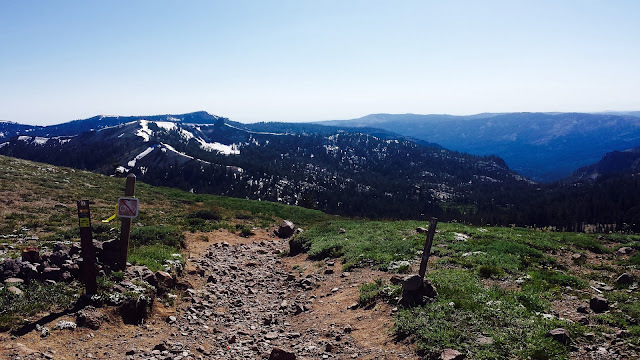 As a backpacker, I became much more confident at navigating by topographic map and traveling off-trail, and I decided to solo backpack the John Muir Trail that year, even though I'd never attempted a solo trip before. A couple of badasses that inspired me early on in Yosemite. That year, I also dislocated my kneecap while cross-country skiing, which resulted in three months of slow recovery. It was the first time in my life I could not be active and I realized how important movement was for my mental health and just how much my personal identity was wrapped up in an active lifestyle. I knew I had always wanted to run a marathon, and duly inspired by my community and heavily desirous of the day I would get to run again, I decided I would sign up for one as soon as I was able. 11 months after my first 30-second jog back from injury, I crossed the finish line at the Oakland Marathon. I finished a full 30 minutes faster than I had hoped/expected, and I actually felt pretty good at the end. A couple of ultrarunning friends began to circle like vultures. "You should really try a 50K. It's only six more miles. Plus, it's on trail. It's way better on your joints. The community is awesome. C'mon, let's sign up for one." 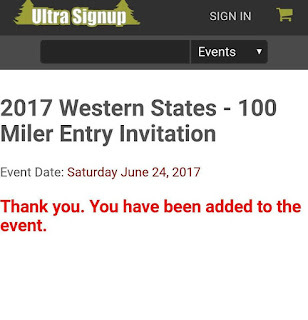 I playfully batted them away, but there was this little voice in the recesses of my brain that said, "Well, maybe..." I figured I'd better go and see what this ultrarunning stuff was all about, so I signed up to volunteer for that race I had heard about all those years ago: the Western States. Western States has 1500 volunteers each year. Volunteers are the lifeblood of the event, making peanut butter and jelly sandwiches, filling water bladders, helping tired runners with their medical needs, marking the course, providing traffic control, and any number of other logistics, frequently in the wee hours of the night, and seemingly always with a smile. I was originally slated to run along the course and tie glow sticks to trees, but a minor injury the week before the race, got me re-assigned to data entry. Ultralive.net, the brainchild of Ted Knudsen, is a brilliant site designed specifically for ultramarathon runner tracking. A whole cadre of folks with ham radios and laptops enter runner times from over 15 aid stations. Spectators, crews, and race personnel can track where runners are on course, their pace over different sections, and their predicted arrival to the next aid station. It's a valuable resource. In 2016, over 62,000 users around the world utilized ultralive.net's live broadcast of Western States, with over 2.6 million page views. I was initially pretty bummed about being reassigned: "C'mon, data entry?! Shoot, I wish I was running the course at sunset, putting up glowsticks." But then I realized I would get to sit at Robie Point: mile 99. If you've never seen a 100-mile race, consider going some time. It is one of the most inspiring events a human being can spectate. In the words of Ann Trason, "I've always just looked at 100 miles as life in a day. You have all the trials and tribulations of a life in one day." And how. To stand at Mile 99 is to see every bit of the human experience: joy, grief, sadness, strength, suffering, sublime peace, grit, frustration, toughness, sleepiness, exuberance, determination, relief. It's a roller coaster. It's beautiful. It was also quite something to be a part of the Western States culture. The people were so nice, so supportive. I chatted with a bunch of old-timers who told stories about old races, about the characters and the places, the close-calls, the mishaps, the legends. The town of Auburn, for lack of a less woo-woo way of saying this, had an energy about it: frenetic, yet peaceful, soberingly hot, yet a playground of light and shadows, smiles and hugs and happy people in abundance. The next summer, I ran my first 50K. It was a small, home-grown event, there were lots of great conversations on trail, the food was delicious, and nobody took the thing all that seriously. It was just a bunch of people who got together to go for a long run in the woods. In 1984, the California Wilderness Act was passed, designating over 3 million acres of public lands under the legal definition of national wilderness. One of those parcels was the Granite Chief Wilderness, which the Western States 100 mile race crosses. 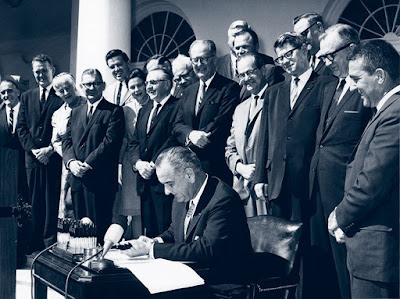 Organized events are not allowed in national wilderness, but Western States was "grandfathered" into the Granite Chief, provided they never exceed the number of participants who ran in 1984: 369. This wasn't much of an issue in the mid-1980s when there weren't all that many crazy people clambering to put their bodies through hell, but the 2000s have seen an exponential increase in participation in endurance events. 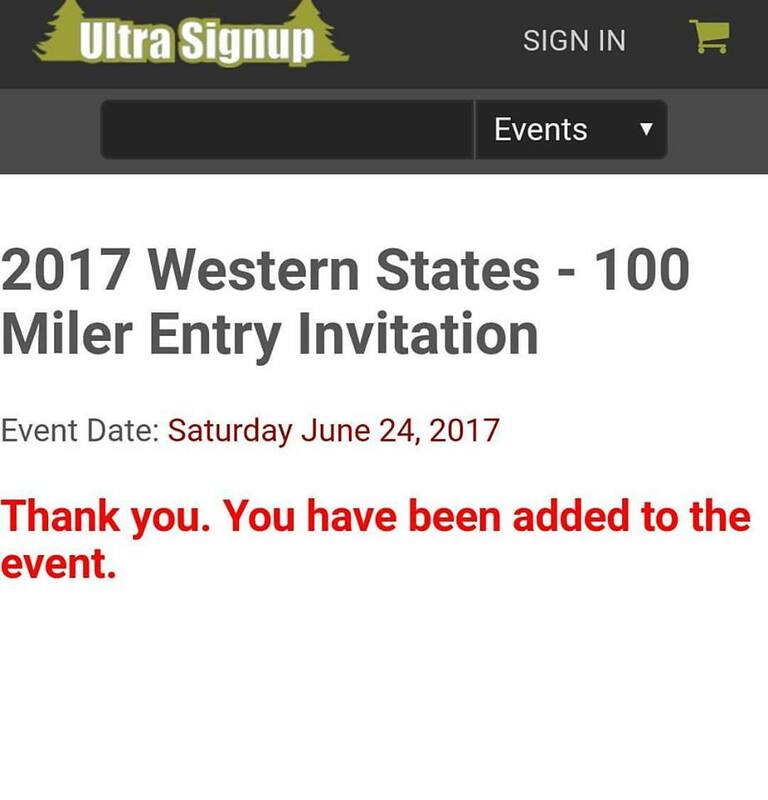 By the time I came to the game in 2012, Western States required that one first run a qualifying standard, then enter their name in a lottery. Each consecutive year one qualified and entered, they would receive an extra ticket in the lottery. Since then, they have updated this rule so that one receives double the amount of lottery tickets in each consecutive year: 1 the first year, 2 the second year, 4 the third year, 8 the fourth year...yeah, it's like The Hunger Games. Needless to say, the odds are slim. The lottery is done by hand, in-person at Auburn High School each December. It draws quite a crowd, filling their auditorium. You realize pretty quickly that if you have only qualified one or two or three years in a row, you are highly unlikely to get picked. Some people qualify for seven years in a row before getting picked. Think about that for a second. What were you doing seven years ago? What will you be doing seven years from now? Think about the changes your body likely undergoes in a span that long. Think about life events that happen in a span of seven years. You can be a completely different person in seven years. Plus, think about what it takes to run at least one 100K race every single year for seven years straight (50-miles used to be the standard, but this was changed in 2015). You have to stay healthy and dedicated enough for years. Almost a decade. It's insane. I believe I had a 6% chance my first year and an 8% chance my second year...despite having double the tickets, there were a lot more people vying for spots! 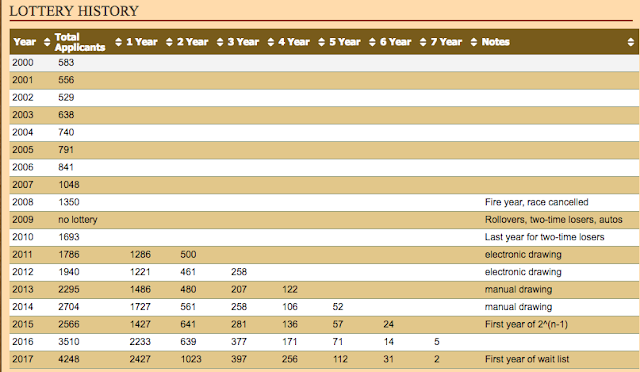 My first year, there were 2,295 people who qualified and entered the lottery. This year, there were 4,248 people! I qualified for five straight years. Anyone who has kept up with me recently knows that I have pined away in hopes of running this race, narrowly side-stepped injuries multiple times, and have left more than a couple lotteries, sad and empty-handed. I did not get picked in the lottery this year, either. There are a number of slots in the race that are reserved for others: the top 10 men and women from the year before, Western States board members, top competitors from the "Golden Ticket" series and Ultra-Trail World Tour, sponsors, an annual raffle that raises money for local student scholarships, and race management. This year, those entries comprised 109 of the 369 spots: 30%. So, 4,248 people were vying for just 260 slots. I was lucky enough to receive a "race admin" slot this year from the data entry folks I volunteer with each year at the race (how lucky am I that I got injured all those years ago?!?). These past years, I have expanded my role, volunteering at two data entry stations, the registration the day before the race, and at the start line the morning of the race. I did not volunteer with hopes of getting a slot; I just genuinely liked being a part of the community and the energy of the event. It was something I looked forward to each year. One morning last November, I was lazily lying in bed reading email, when I saw one titled, "What are you doing on June 24, 2017?" When I opened it, it read, "Because your lottery odds just went to 100%." So, what's the big deal, anyhow? This is a question I have asked myself. It's hard to say. I've come to see Western States as the "Half Dome" of ultramarathons - it's iconic and beautiful and so many people want to do it that it takes on mythical proportions as people try to get in through the lottery. Is it the end-all, be-all ultramarathon? No. Is it the most beautiful? No. Is it the hardest? No. Turns out hiking Half Dome is pretty fun. However, it is the oldest 100-mile endurance run in the world, and it does have quite a history. There is Gordy Ainsleigh, who started it all when he decided to run 100 miles alongside the horses in the Tevis Cup after his horse lamed up before the event. There is Brian Morrison, who was about to win the race in 2006, but collapsed 250 meters from the finish, and was eventually disqualified for taking a helping hand from his crew. There is Gunhild Swanson, the oldest woman to finish the race at age 70, who rounded the track in Auburn literally in the final seconds before the 30-hour cut-off. 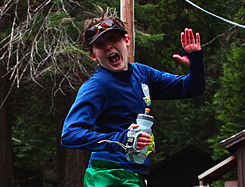 There is Meghan Arboghast, who has finished Western States under 24 hours, 10 straight years in a row, most recently taking 6th place among women at age 55. Just last year, Jim Walmsley was poised to crush the course record, when he took a wrong turn at mile 93. Instead, the youngest winner in history, 20-year-old Andrew Miller, took the win. There are hundreds of stories like this in the lore of Western States. These are just a couple off the top of my head. There's the course itself. 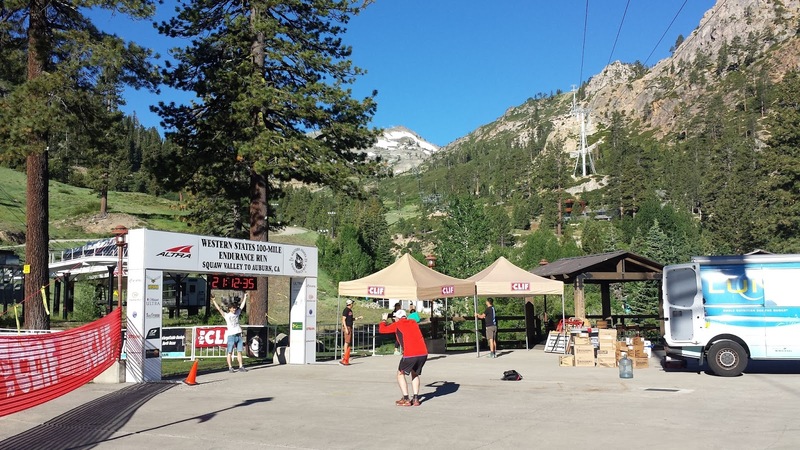 It's a point-to-point race from Squaw Valley to Auburn. It encompasses the high Sierra, two of the American River Canyons, some of the most iconic single-track the California foothills have to offer, one middle-of-the-night hip-deep river crossing, and a dramatic finish on the track at Auburn High School. It appeals to me because it features three types of running terrain I excel at: technical downhill on single-track trails, long sustained climbs, and heat. Temps at the bottom of the river canyons can reach well over 100 in late June. Add it all up, and it's a pretty cool adventure. Looking west from the Squaw Valley summit. All downhill from here. Well, something like that. That's not even mentioning the best part: the community. There is the Western States community, of course: the old-timers, the race management, the volunteers that come back, year after year (many of whom who aren't even runners!). There's also the ultra-community. If you're an ultrarunner, chances are you know someone who is racing or pacing or crewing. It's a scene. Thousands of people come out to cheer and support. On race weekend, you enter any restaurant or bar, and you will see folks in running attire milling about, talking about how the race is playing out. Everyone understands the uniqueness of the event, how special it is to take part, and that adds to the magic. Like every ultra event I've ever participated in, just as much energy and respect is shown toward the slowest runners as the fastest. Running 100 miles is a feat, no matter how fast it is done, and everyone there gets that. I'm three and a half weeks away from running Western States and it's hard to express how I feel. I feel great about how my training has gone this year, and I've assembled an incredible crew to pace and support the day. At this point, there's not much left to do, but to rest the legs and make sure I don't do anything stupid in the next couple of weeks. In some ways, I feel like it's just another race. It will be what it's going to be, and ultimately, it's just another trail race. Sometimes I feel like this is a ball and chain to be free of - no more qualifiers hanging over my head each year, and I can start focusing on other runs I'd like to do. On the other hand, I'm sure once I cross that finish line, it will be bittersweet - after dreaming and working toward a thing for so long, there is undoubtedly a hole left behind when it is over. Ultimately, though, I mostly feel excited for the adventure. I may only get this chance once and I intend to make it the very best I can. See you in Squaw. Jones-Wilkens, Andy. "The Long Road Back for Brian Morrison." IRunFar. IRunFar, LLC, 4 Sept. 2015. Web. 31 May 2017. <http://www.irunfar.com/2015/09/the-long-road-back-for-brian-morrison.html>. "Lottery." 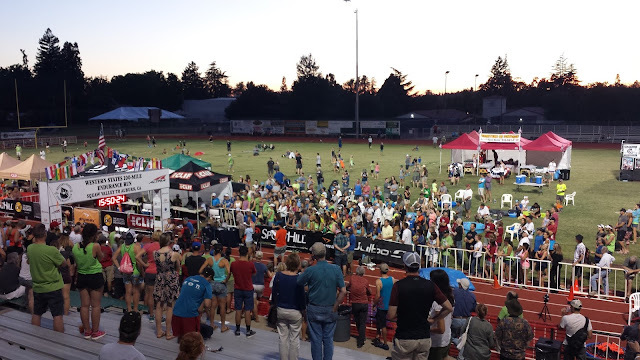 Western States Endurance Run. N.p., 16 Dec. 2016. Web. 31 May 2017. <http://www.wser.org/lottery/>. "Meghan Arbogast's Results." UltraSignup. Web. 31 May 2017. <https://ultrasignup.com/results_participant.aspx?fname=Meghan&lname=Arbogast>. "Records." Western States Endurance Run. Western States Endurance Run Foundation, 2017. Web. 31 May 2017. <http://www.wser.org/records/>. Strout, Erin. "A Running Life: Ann Trason." Runner's World. Rodale, Inc., 25 May 2015. Web. 31 May 2017. <http://www.runnersworld.com/runners-stories/a-running-life-ann-trason>. Stulberg, Brad. "Jim Walmsley's Insane Day at Western States." Outside Online. Mariah Media Network, LLC, June 2016. Web. 31 May 2017. <https://www.outsideonline.com/2094661/jim-walmsleys-insane-day-western-states>.